Brighten up your party with a sparkling punch that has a lovely floral accent. 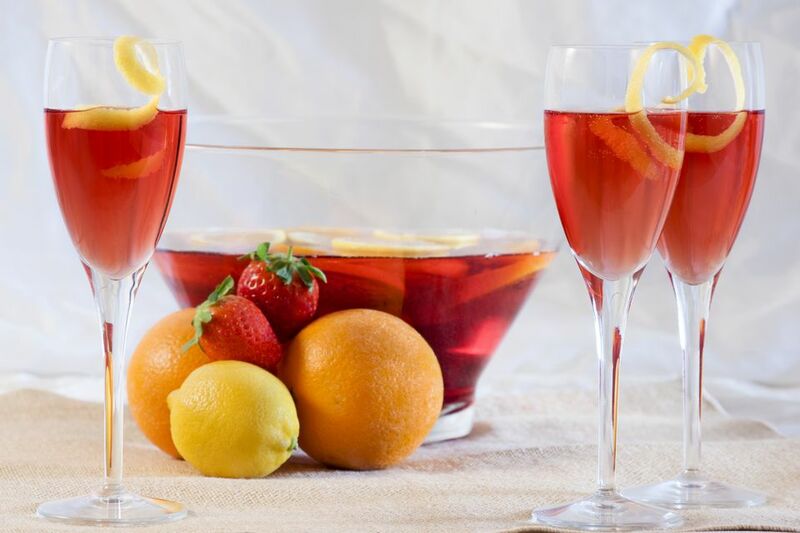 The cranberry elderflower Champagne punch is a simple recipe that comes together in just minutes and its flavor will fascinate all of your guests. This recipe is extremely easy to mix up, even at the last minute. It combines the sweet elderflower taste of St. Germain Liqueur with cranberry and lemon juices and finishes it off with a double dose of sparkle. The result is a refreshing drink that is perfect for spring and summer parties. In a large pitcher, combine the elderflower liqueur, cranberry and lemon juices, and simple syrup. When it's time for service, pour the spiked juice mix into a punch bowl and top with sparkling wine and soda. Garnish with cranberries, seasonal fruit, or citrus slices. To give the punch a lighter profile, use white cranberry juice. It's a perfect complement to the elderflower and allows the florals to shine a little brighter. Also, white cranberry is not quite as sweet as the more common red cranberry juice. Like sangrias, it's best to mix up the base of the punch and allow it to rest in the refrigerator overnight. This helps to marry the flavors and creates a more uniform taste. Yet, if you didn't plan ahead and need a quick punch right before the party, it will work out just fine. Even though this is called a "Champagne punch," Champagne is not required. Whether it's Cava, Prosecco, or a bubbly rosé, your favorite sparkling wine will make a great punch. Just be sure to add it and the soda right before service so your guests can fully enjoy the bubbles. There's no need to include ice in the punch if you chill all of the ingredients ahead of time. You can certainly add ice if you like and it's not a bad idea if it's a hot day. A simple ice ring always looks great in a punch bowl. It can be made with your bundt pan and you can even freeze fresh fruits inside. You do need to think ahead though. Large pieces of ice take longer to freeze, so try to give it at least 24 hours, if not longer. You can also use large ice balls or freeze ice in nearly any large container that will fit in your bowl. Keep in mind that the larger your chunks of ice, the slower they will melt. For a party punch, it's always best to avoid the average-sized ice cubes that are in everyone's freezer. If you want to avoid any chance of watering down your punch, place the punch bowl in a tray of ice. As the ice melts, simply dump the water and add more to keep the bowl cool. How Strong Is a Cranberry Elderflower Champagne Punch? All of the nonalcoholic mixers used in this punch offset the liqueur and wine, bringing the alcohol content down to a very pleasant level. Though it will vary, you can generally expect it to mix up to 7 percent ABV (14 proof). It's a lot like serving your guests beer, only much tastier.